There are all kinds of summer camps for boys specializing in teaching everything from tennis to computer programming. However, the recent TFP Summer Program in Louisiana was a unique experience. 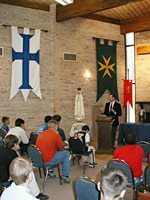 “The Call to Chivalry” was the focus of this event, which was held from July 3-10 in the backwoods of Norwood, Louisiana north of Baton Rouge. 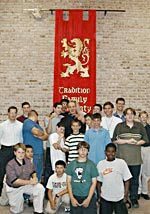 The program for boys (ages 12-18) and their fathers was the first in Louisiana and proved an excellent opportunity to instill Catholic heroism and courage in participants of all ages. TFP Summer Programs combine prayer, lectures, outings, and games tailored to the needs of today’s younger generation. They aim to show how the age-old values of the Faith can be applied in the modern world. Louisiana’s special Catholic and French heritage was an excellent backdrop for the program’s lectures and talks. Participants studied the three most important Revolutions in the West: the Protestant Revolution, the French Revolution and the Russian Communist Revolution. They also discussed inspiriting examples of Catholic heroism and chivalry such as the Great Siege of Malta in 1565. There were lively debates on today’s Cultural Revolution as exemplified in fashion, music and art. 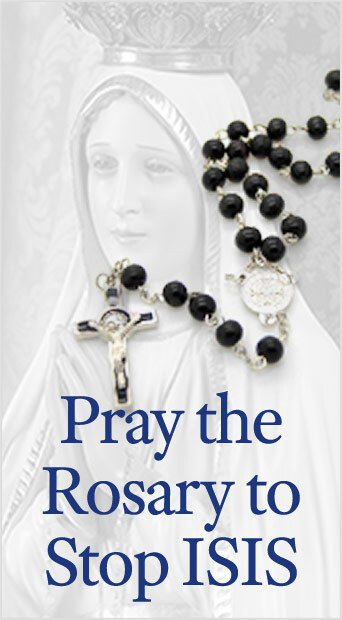 Other presentations included talks on the importance of the rosary, and devotion to the Blessed Mother. The program also included outings to the Vicksburg National Military Park and the Port Hudson State Historical Site. A trip to the newly restored St. Mary’s Basilica in Natchez, Miss., founded in 1841, was also special treat. Throughout the course, vigorous games were part of the daily activities. The climax was on Tuesday, July 10, when the boys divided into teams and tested their courage and knightly qualities in “medieval games.” Calling upon St. Louis the King or St. Michael, the boys competed in games of French football, dodge ball, shield ball, or tug-of-war, on a field richly decorated with standards and flags. The highlight of the Louisiana Summer Program was the closing medieval banquet following the games. Monsignor Robert Berggreen of St. Agnes parish in Baton Rouge led a rosary procession to the “banquet hall,” a transformed picnic structure nestled in the woods. Proud parents and hungry sons were treated to the best of Cajun cooking and conviviality. Local TFP supporters also joined the truly enjoyable gathering. The first Louisiana TFP Summer Program was an unforgettable experience for all participants. This year’s focus on chivalry was uplifting and inspiring. As the boys piled into their cars and said their last goodbyes, everyone was unanimous in thinking about the need for more such programs in the future.